At a glittering function held recently at Mumbai's The Leela's hotel called 'Celebrating the life journeys of successful Indian Business Leaders', an inspirational book 'Added Value', by renowned author, Peter Church was launched. The Essel Group Chairman Subhash Chandra also features in the book for being a leader who changed the face of the Nation. 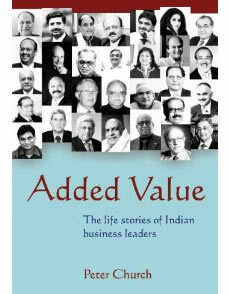 This inspiring book combines invaluable advice with remarkable and candid inside stories of 30 Indian business leaders. The book talks about the lives of these leaders who have added value not only to their business or profession, but to their country as well. This motivating book focuses on these great leaders and their thoughts on success and what makes them so extraordinary. To celebrate their life journeys were India's eminent business leaders like Subhash Chandra-Essel Group and ZEEL, Kishore Biyani-Future Group, Capt. GR Gopinath-Air Deccan/Kingfisher, Habil Khorakiwala-Wockhardt, Harsh Mariwala-Marico, Capt. CP Krishnan Nair-The Leela, Dr. Anji Reddy-Dr. Reddy's Laboratories, Vijaypat Singhania-Raymond, Arun Firodia-Kinetic Group and Dr. K Ravindranath-Global Hospitals, were present at the event. These thought leaders not only shared the struggles of their lives but some interesting anecdotes also with the audiences present. Enlightening and fascinating, this book, Added Value celebrates larger than life ambitions. It brings forth the struggles of all these great business leaders, their uncompromising vision, never give-up attitude, willingness to take risks and a passion to add value not only to their company but for their country as well. Grab a copy of Added Value and get inspired!